As anyone who reads this blog will surely know I am a huge fan of Hugh Fearnley Whittingstall and one of the first recipes that I earmarked in his River Cottage Everyday book is Gill’s poached leek and Dorset Blue Vinny tart which, despite it’s use of blue cheese, sounded right up my street. 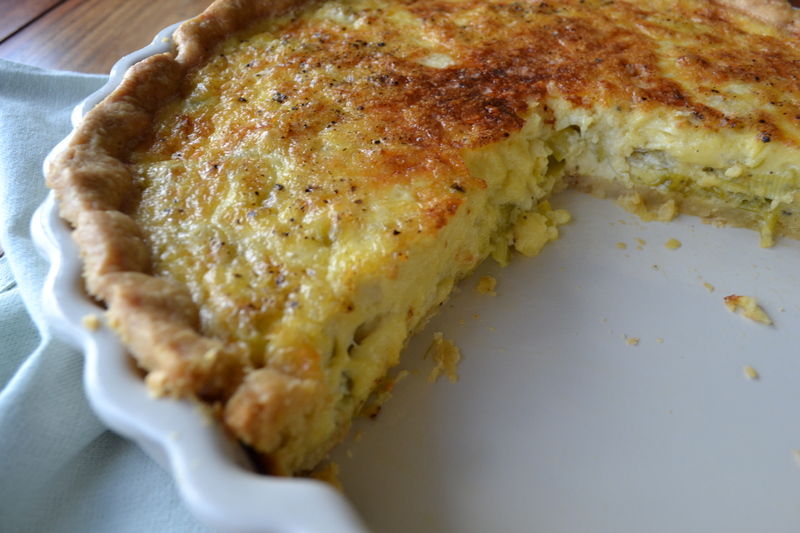 Whilst it may look like and sound like a quiche it really isn’t – it is lighter, creamier and softer, which I guess is down to fewer eggs. I substituted the blue cheese for my favourite cheese of all, the humble cheddar, and it was delicious. I recommend using a really strong vintage cheddar as this is quite a creamy tart so it really needs that strong sharp flavour. The tart can be eaten warm or at room temperature and is so light and full of flavour and I will definitely be making this again, and again, and again. It makes a perfect summer lunch or dinner served with a green salad tossed with bacon lardons. Put the flour, butter and salt in a food processor and pulse a few times until the mix looks like breadcrumbs. Add in the egg yolk and then whilst pulsing a few more times slowly pour in the milk in a steady stream – only use enough to bring the dough together. Turn the pastry out on to a lightly floured surface and knead gently a couple of times and then wrap in cling film and rest in the fridge for at least half an hour. Remove from the fridge and roll the pastry out on a lightly floured surface until it is quite thin (around 2/2.5mm) and big enough to line a 25cm tart tin or dish. I tend to use the cling film trick (I think I first saw Rachel Allen doing that) by rolling the pastry between large sheets of film – this stops the pastry sticking and also makes it much easier to lift in to the tin. Remove one side of the cling film and carefully lift the pastry, and place it bare-side down in to the dish or tin. With the cling-filmed side now facing you press carefully so that the pastry sits snugly in to the dish. At this point I put the dish with the lined pastry back in the fridge for half an hour to chill further. Preheat the oven to 170C (gas 3) and remove the well chilled pastry from the fridge, peel off the remaining cling film and use a sharp knife to trim the pastry so the edges are neat and prick the base of the pastry several times with a fork. Then crumple up a piece of greaseproof paper in to a tight ball then open it out and use it to line the pastry so that you can then place baking beads or beans on top to ensure the pastry doesn’t puff up in the oven. Bake for 20 minutes, then remove the greaseproof and beans and bake for a further 5 minutes to crisp the base. Put the leeks in to a saucepan with the water, butter and salt and pepper. Over medium heat bring to a low simmer and then turn the heat low, cover and poach gently for around 10 minutes until just tender, stirring a couple of times. Drain the leeks over a bowl, reserving the cooking liquor, then spread the leeks over the base of the tart and then cover with the grated cheese. Turn the oven up to 180C (gas 4). Add the eggs, egg yolks and cream to the leek liquor and beat until smooth. Season to taste and pour over the leeks and cheese and then carefully put the tart back in the oven and bake for around 30 minutes until it is just set and there is a very slight wobble when you shake the tin gently. Remove from the oven and serve warm or allow to cool to room temperature. Hola Aife. I made this at the week-end and used blue cheese. It was a brilliant idea (with a couple of other things) for a tapas dinner on Sunday. All loved it!…Down to last crumb!..